Before we reveal the meaning of 步, let us try to disassemble 步 to see what we can get. Upper part of 步 is obviously 止, lower part is unknown to us yet. From 止 however, we know that 步 must be related to foot. But what is its exact meaning? Looking at the simplest version of the Oracle Script - , 步 is obviously composed of two feet, one left and one right. 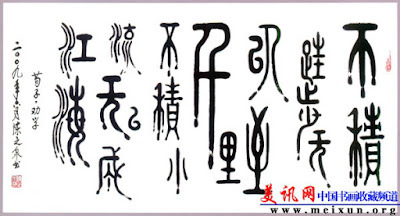 Its Bronze Script shows the idea even clearer. 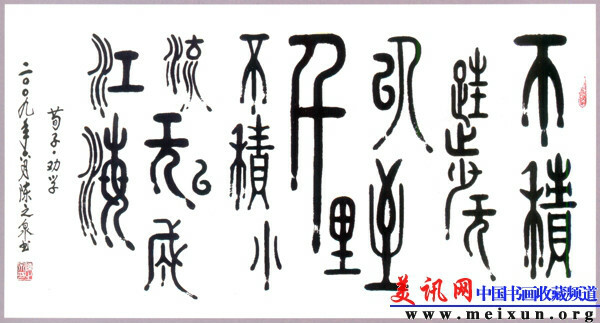 Some of the Oracle Scripts of 步 contains , which has the meaning of walking along the road as what we have learnt before. So 步 has the meaning of walking by feet. From the drawing of or , it is naturally used to mean a unit of linear measure equals to "one step by right foot plus another step by left foot". Further more, from Oracle Scripts of 步, we can see that it has the meaning of steps as well. Same as steps in English, 步 has all the meanings the English word step has. Please remember that is also a drawing of our foot, the right one.